Hillyard Debrowner II, HIL0090704, is a unique, extra strength treatment formulated for easy removal of browning in carpet. It works fast to remove browning, set colors, and to reduce fugitive dyes. Debrowner II is effective for removing coffee, tea, urine, and yellow oxidized stains from light colored carpet. It works on all carpet, except dark or Advanced 5th Generation Stain Resistant carpets. Debrowner II is also an excellent choice for removing water spots from carpet. 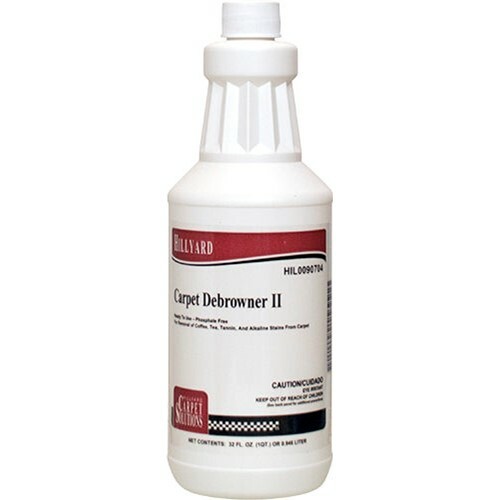 Treating carpet is easy with Debrowner II is ready to use formula. Simply spray lightly over the area to be treated, and the carpet starts to lighten within a few minutes. Then, clean the treated area with a quality Hillyard carpet cleaning product, like Deep Action II, Clean Action II, Clean Release, or Carpet PreSpray and Traffic Lane Cleaner. Packaged in quarts, Debrowner II is the perfect product to keep around for treating those unreported coffee spills.